Imagine driving across America using a fuel so new you have to carry your own supply wherever you go. At the start of the 20th century, before the era of ubiquitous gas stations, drivers did just that as they tested the limits of cars like the Ford Model T, which ran on gasoline, kerosene or ethanol and could, if driven carefully, travel more than 150 miles on a full tank. Now a new generation of drivers is set to embark on a similar experiment. Until recently, most electric vehicles have had a range of just a few dozen miles, limiting their usefulness and appeal. That is a big reason the long-talked-about era of electric vehicles has been talked about for so long with little real-world progress. Over the next couple of years, though, tens of thousands of electric cars will hit the laneways of Europe, the streets of the United States, and the gleaming highways of Asia. These new battery-powered vehicles have much longer ranges than their predecessors -- up to 250 miles in the case of the Tesla Roadster, but mostly about 100 miles -- and are likely to be the first to sell in large numbers. By 2020, says J.D.Power Automotive Forecasting, annual sales of electric vehicles will reach 2 million. Banking giant HSBC is even more optimistic and puts the figure at 9 million. That still falls short of the 61 million gas- and diesel-driven vehicles sold around the world in 2009, but a huge leap from the 5,000 or so EVs sold last year. Even as these shiny new vehicles take to the road, serious questions remain about the infrastructure -- or rather, the lack of infrastructure -- to charge them. In an echo of last century's battle over the best fuel source, the way in which the coming fleet of electric vehicles will be recharged has not been settled -- and all the proposed models have flaws. 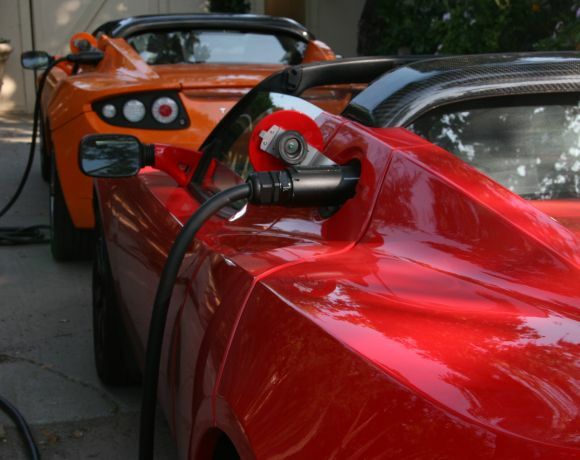 Some experts believe EVs should plug in at a driver's home or workplace. Others back a global network of roadside recharging stations. One prominent company is pushing the idea of gasoline station-like outlets where you can zip in and quickly switch your almost-dead battery for a fully charged one. Another group advocates avoiding "pure" EVs and the problem of charging infrastructure altogether, focusing on hybrid cars. The stakes are huge: the pace of the shift to electric vehicles, progress in the fight against climate change, and a market that HSBC Group bullishly forecast this week would grow 20-fold by 2020 to $473 billion -- a fifth of the entire low-carbon economy. Despite the hype, it is almost impossible to predict the format or formats most likely to win the great electric vehicle infrastructure battle. Model T owners adopted gas as their fuel of choice for reasons both obvious -- the falling price of gas -- and unpredictable: prohibition in 1919 forced ethanol off the market. The variables today -- technology, political interference, the psychology of car-lovers -- are similarly hard to pin down. "The introduction of electric vehicles is more than a financial matter," says U.S. analyst Sam Jaffe, research manager at IDC Energy Insights. "It's a big anthropological experiment. There's no question that there are drawbacks, but there are also advantages. It requires a resetting of mindsets and how that unfolds will decide who wins the race." The starting grid for the coming electric vehicle race is filling up quickly. Mitsubishi Motors Corp.'s jelly bean-shaped i-MiEV has been on sale in Japan since April and will launch in the United States and Europe over the coming few months. The Japanese automaker is also making two versions of the car for French automaker PSA Peugeot Citroen. Nissan is set to roll out its edgy-looking Leaf in December, while corporate partner Renault will start selling its mid-sized Fluence ZE (for zero emissions) in the first half of next year. Europe's biggest automaker Volkswagen AG, a late entrant in the competition, plans to launch all-electric vehicles in 2013, though it says zero-emission vehicles will account for 3 percent of sales by 2018. These "pure" electric vehicles face competition from hybrid cars. These vehicles can charge at a plug-in socket or switch over to gasoline, and include General Motors' Chevrolet Volt, which goes on sale in the United States this year for $41,000, and in Britain a year later. 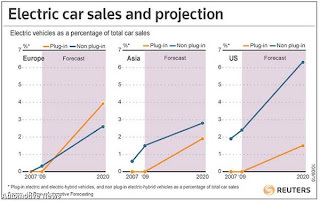 Will the charging infrastructure be able to keep up with all those new cars? The question is critical. "If it's too difficult to charge an electric vehicle, too inconvenient, the customers will not buy them," says Christian Feisst, managing director of business development for smart grid at U.S. networking giant Cisco Systems. "Today a lot of the work is around battery technology and the behavior of customers. There is not a lot of work done around the charging technology, or the charging process itself, nor how to manage charging." One company that is sinking millions into technology is Better Place, a three-year-old California firm that has raised about $700 million from investors and imagines a vast global network of "switch stations." These gas station-like outlets allow drivers to swap a spent battery with a fully charged one in a few minutes. Led by soft-spoken Israeli-born founder Shai Agassi, a former executive at SAP, the company boasts of having built "the largest cleantech investment in history." Last January, HSBC bought a 10 percent stake that valued Better Place at $1.25 billion. Since earlier this year, the eco firm has been running a trial in Tokyo using three taxicabs and will soon start testing a small network of stations in Israel, where it says it has deals with 92 corporate fleet owners. It expects a commercial launch in Israel and Denmark in late 2011, and has plans in five other countries, including Australia, China, and the United States. Well.... Wouldn't it be great to have a larger SUV with un-limited Drive Range ? Hummm ... Yea we think so to. We have custom engineered a design for a larger SUV that has Un-Limited drive range ! AND. We are talking about. NON-NEVER, EVER Plug-in ever again ! Yuppers ! Our Armadillo SUV using our E2E system is designed for un-limited drive range ! Ok wanna know how it is that we can make this claim ? For example: If it was driving up a hill. In which case... It is using more power than it is making or storing. Once its at the top of the hill and if its a flat top road for a bit. It then go's back to doing all the 3 mentioned above. Once its driving downhill. Its creating MORE power and Storing MORE power THEN its using ! Many years of much secrete R & D and we havent said ANYTHING until recently. Why did we wait ? Well having irrevocable proof for the above statement is VERY important. Such is the case. We have a stand alone " Stationary " prove of concept " prototype "
This is a 3.8 Billion USD global project. Private Investors are welcomed ! We are seeking 2 million USD to build the mentioned SUV prototype. So that we can drive it from Manhattan to LA and back without ever needing to., ever plug-in at all. Our goal is to. Finally proving for all to see our SUV = endless electric SUV mile range !